Today, we have a very special guest post from Disney InsidEAR Sarah Orr. She shares with us an exceptional Cast Member story and why it's a great idea to let guest relations know when you've had phenomenal service at Disney. Have you ever written a letter of thanks to Mickey about a Cast Member at Walt Disney World who went the extra mile and put a smile on your face? Maybe you have mentioned an outstanding Cast Member in one of those surveys you received after returning from your vacation. Or perhaps you took the time to send an email or to fill out a card at Guest Services in the parks about a Cast Member who went above and beyond their job description to help make your day a memory that will last forever. If you have, your words of gratitude just may end up in the Walt Disney World Cast Member newspaper, Eyes & Ears. Over at the Disney Parks InsidEARS website's beta test we get to hear these fun and memorable stories about outstanding Cast Members who make us want to return to Walt Disney World year after year. Here is the excerpt from the Cast Member newspaper, Eyes & Ears, where a Guest tells about a Cast Member who has become a part of their family vacation memories over the past several years! Jay, an Eyes & Ears writer, tell us the story of Mel and Maria and their memorable meeting. When Mel and her family arrive at the Walt Disney World Resort for their annual vacation, they know what one of their first stops will be: Beaches & Cream Soda Shop. 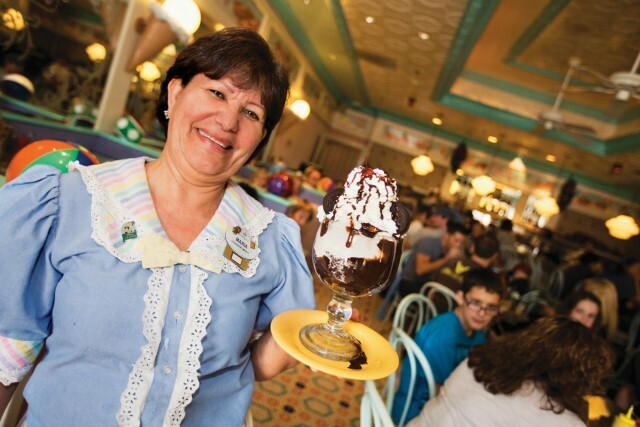 The Spring Hill, Tenn., residents love the foods and treats found at the old-fashioned ice cream parlor at Disney’s Yacht & Beach Club Resorts, but they love seeing Maria just as much. Maria is a Food & Beverage server who has left an indelible impression on the family, especially their two girls. Mel wrote to say that during the past 12 years, family members have found themselves spending more and more of their two- to three-week Orlando vacations at the Disney parks because of Cast Members such as Maria. Indeed, she has almost become a fixture each time the family visits. Mel said that while they have visited some other attractions in the Orlando area, they now spend about 95 percent of their time at the Walt Disney World Resort. “Other parks simply don’t compare to the experience we get at Disney … . Thank you to Community Manager Marissa at Disney Parks InsidEARS for sharing this story with us from Eyes & Ears! What is your favorite Cast Member Story? Make sure to share it in the comments OR on our Facebook page. I agree with the vacationer that Disney is now where we spend most of our time in Orlando for that very reason. Once you've had all those smiling faces and cast members doing all they can to make your vacation magical, well when you go to other parks and attractions, you all the sudden just feel that the others are just doing a job. I could stay home for that kind of humdrum service and attitude. Disney has ruined us for other vacation destinations. So thankful to the cast members as they are a HUGE reason why we return.